It's really funny when you've known somebody for a long time, when they were 'nobody', even when there was barely any 'fandom', and then time passes and that person becomes one of the most famous artists in the fandom. Cuz... who doesn't know Kenket nowadays, either by her work alone or in the Blotch team? I met her in ... 97-98'ish? when we were in The Lion King Muck, which was a gateway drug to the furry fandom for many of us. She was a black cheetah first, then had a baby meerkat character, then her current raven self. So we've become good friends long ago. She been to my place, we went together to watch TLK-Imax in London, we met in San Francisco too, then circumstances set us apart for years. We just followed different paths. But last year I suddenly stumbled into her in MFF, and then again last summer in AC. I just had to 'take advantage' of our old friendship, and bribe her with some beers so she'd make an exception with me and draw in my sketchbook. So this is why my fursona here has a TLKoB t-shirt. We're big TLK fans forever. And I love this sketch because of a lot of reasons. I loved to see her again, and hang out with her for a while, and surely hope to see her many more times again from now on! The lion king isn't just our entry to the fandom, it brings us together. Its great that your and your friends are catching up with each other. 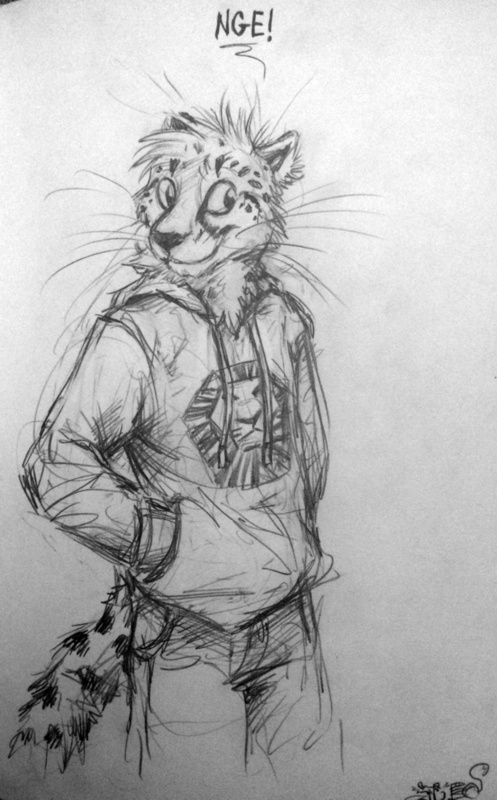 Also, like the hoodie, simba's face was drawn very well. The TLK fandom was very big in the 90's. Nowadays it's kinda faded away, only the very fanboys (and girls) remain, and we've been absorbed into the 'furry fandom'. But like other sub-fandoms in the fandom, we all got our own style! A la artista :D Y siii, en su linea! Si no la conocias, te recomiendo de verdad visitar su galeria!